Easter was never a big Holiday to me when I was growing up. I was at the tail end of a large brood of children, so by the time I came along, the festivities associated with eggs and baskets had pretty much worn thin around my house. That’s why I was so happy that I remembered to run to the store and get some things to make a basket for the kids on Saturday night. It wasn’t a lot of stuff, just enough to make it a bit more special than your average Sunday. 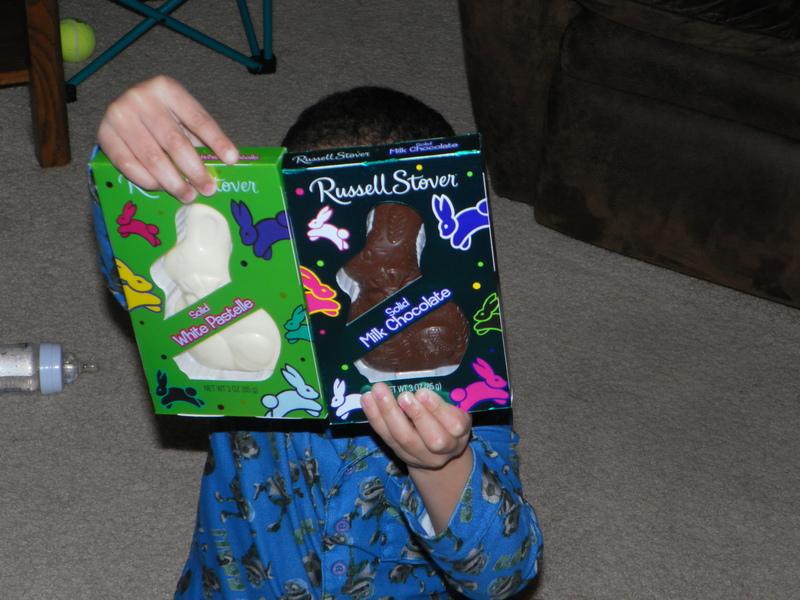 Proving that you are what you eat, the boy’s head morphs into ebony and ivory bunnies. We are big on diversity in the animal-shaped confections we devour. He came over and examined the contents carefully. He was pleased at the discovery. “Did you see anybody around here?” he asked. He nodded as my description fell in line with the profile he was concocting in his head. His eyes narrowed as the pieces fell into place. “The Easter Bunny,” he announced, in the same tone that Batman uses to identify The Joker as the culprit. We hadn’t planned anything else, but at the last moment, my wife decided to hide some eggs. Aspiring hoarder that she is, she just happened to have some plastic eggs hanging around waiting to justify their existence. She rounded up some stickers and restaurant mints, but mostly she filled the eggs with pennies and nickels. There were 14 eggs to find, and when he’d found about 11, he asked for my help. This was not so much fun for me, because I hadn’t seen where my wife hid them, and I already spend enough time looking for things around my house. When we had finally found all the eggs, he pulled out the coins from his collection of loot and fed them to his piggy bank. The stickers and hard candy were soon forgotten. He’ll probably see the same ones again next year. Altogether, he probably raked in upwards of a dollar in cash. That, plus the fresh chocolate rabbits in his basket, made it an excellent Easter. As for his little brother, he had some milk in his belly and a warm, soft mommy to cuddle up with. When you are barely one year old, that makes for just about the perfect Holiday. This entry was posted in Holiday Hijinks and tagged babies, children, Dads, family, fatherhood, holidays, humor, kids, parenting, Sons. Sounds like you’re all set for your 4th of July egg hunt. Advanced planning is the key to a successful Holiday event. Thanks, Sandy. But it was all the Easter Bunny’s doing. You should have demanded a cut from those last three eggs. Yeah. Like I’m gonna start a fight with a four-year-old over 7 cents. Good one! “I didn’t see that coming” heehee. Your son sounds like a hoot. I handed Gage a basket full of fun stuff and said Happy Easter. I should probably tell him about the Easter Bunny. My boy is a real joker – gets it from his mother. I kinda like your method; let the Easter Bunny do his own promotion. What are you, his publicist? I was a poor Easter Bunny and Tooth Fairy, there are probably still rotting eggs somewhere in our old house. It didn’t take my kids long to catch on to who was behind the whole scam. Just blame it on smart kids.